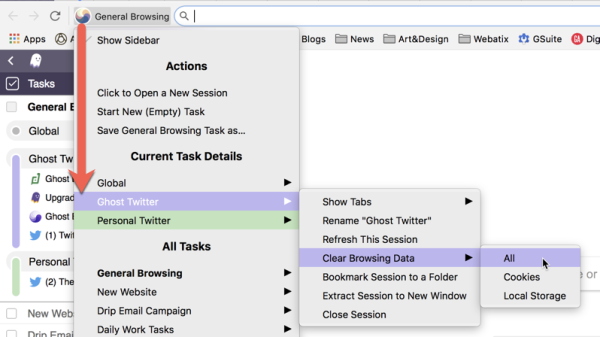 Because Ghost Browser is designed to allow you to log into multiple accounts using the Sessions feature, we created a way for you to clear the cookies/local storage for each Session so that you're not clearing the cookies/cache for the entire browser. The quickest way to clear cookies for each Session is to use the drop-down menu to the left of the address bar. Click the button to the left of the address bar (see screenshot below). Hover over the Session name of which you'd like to clear the cookies. 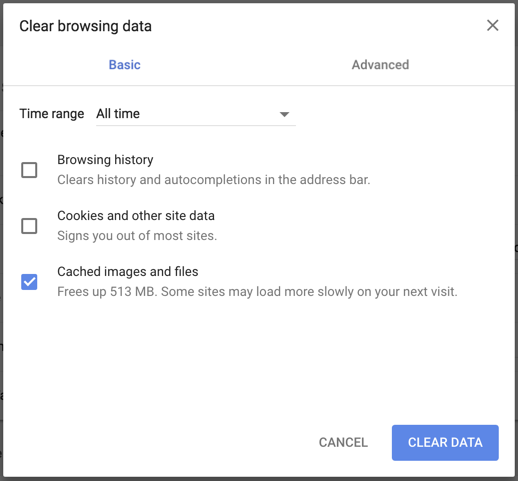 Hover over the Clear Browsing Data menu option. Select whether you'd like to clear cookies, local storage or both. However if you want to clear the cookies and cache for the entire browser please do the following. Please note that this will apply across all of your Workspaces and Sessions across the entire browser. Click the browser menu in the upper right corner of the browser (3 dots). Select the data you want to clear for the desired time.